Dr. Chang is currently a fourth-year Radiology Resident at Boston University Medical Center, Boston, MA. He earned his BA in Biology from the University of Pennsylvania, his BS in Health Care Management from the Wharton Undergraduate School of Business, and his MD from the University of Pennsylvania School of Medicine, Philadelphia, PA. He completed a transitional-year Internship at Advocate Ravenswood Medical Center, Chicago, IL, before entering residency. Dr. Chang will begin a Cross-Sectional Imaging Fellowship at Johns Hopkins Hospital, Baltimore, MD in 2005. Dr. Jara is an Associate Professor of Radiology and an Adjunct Associate Professor in the School of Biomedical Engineering at the Boston University School of Medicine, Boston, MA. 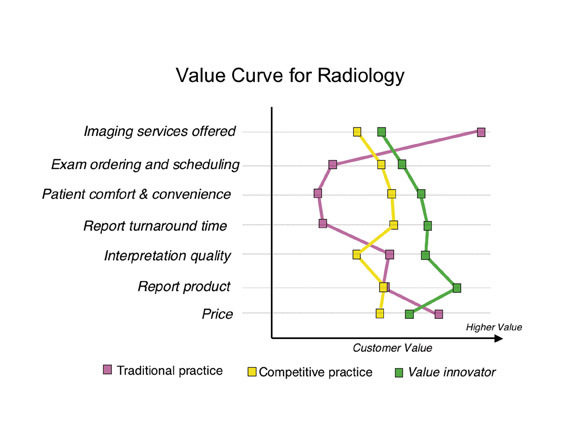 Most radiologic interpretation with magnetic resonance (MR) imaging has focused on qualitative visual assessment of anatomy and disease processes rather than quantitative analysis. This method of interpretation has served to define gross extent of disease when anatomic changes manifest as visibly detectable differences in signal intensity. If scan parameters and timings are not set optimally prior to scanning or if the patient is unable to cooperate throughout the entire length of a study, qualitative interpretation of the resulting directly acquired images suffers dramatically. In these ways, the current conventional practice of MR imaging may be seen as relatively inefficient in the extraction of MR information from tissues and organs when compared with quantitative MR imaging (Q-MRI) techniques. Conventional or directly acquired MR images are qualitative and contrast-weighted where pixel values have meaning only in relation to other pixel values. These pixel values are dependent on a complex mix of proton density (PD), longitudinal relaxation time (T1), and transverse relaxation time (T2) based on the initial scan settings. Q-MRI portrays the spatial distribution of absolute biophysical parameter measurements on a pixel-by-pixel basis. Biophysical parameters quantified by Q-MRI include the primary triad of T1, T2, and PD. Other parameters currently measured in clinical practice are the diffusion coefficient and diffusion tensor, perfusion, and blood-oxygen-level dependence (BOLD) in functional MR imaging. Quantitative parameters investigated experimentally have also included T2*, T1ρ, and the magnetization transfer ratio. These quantitative measures are theoretically independent of experimental settings (such as magnetic and radio-frequency [RF] field, inhomogeneity, receiver gain, and coil sensitivity), and are thus absolute and comparable between different scanners, different institutions, and over differing points in time. 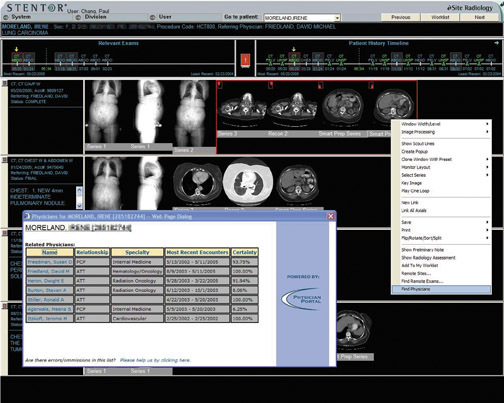 Quantitative and qualitative MR imaging offer complementary medical information and use the same technology platform and equipment. While the patient information generated with conventional scanning is primarily visual, Q-MRI portrays information that is intrinsically more tissue-spe-cific and is consequently less dependent on subjective visual assessment. The quantitative data generated by Q-MRI (eg, T1, T2, and PD maps) can also be postprocessed to take advantage of new ways of looking at the wealth of in-formation available such as segmentation based on biophysical properties and anat-omy, distribution histograms, and synthetic MR images of user-definable and variable weighting (variable at the time of image interpretation). The purpose of this paper is to delineate the principles of Q-MRI relaxometry and to provide a review of its clinical applications. The defining aspect of quantitative image information, as opposed to qualitative image information, is that quantitative pixel values are devoid of extraneous experimental information and are therefore largely tissue-specific. Accordingly, Q-MRI may be viewed as a collection of MR imaging techniques with which the tissue-specific information contained in the directly acquired images can be separated from experimental conditions. Generating quantitative MR images of the human body is accomplished in 2 phases. 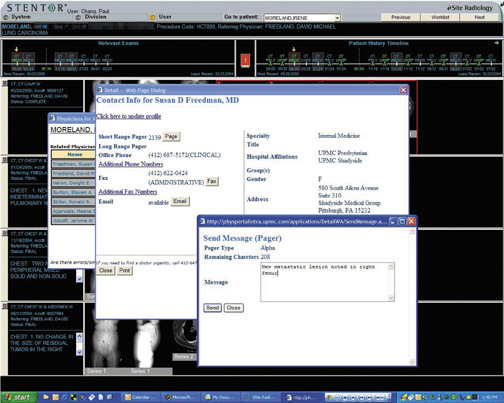 First, a Q-MRI pulse sequence is employed to generate directly acquired images. For every slice, there are 2 or more images that are identical in all experimental conditions except for the weighting in the target parameter (eg, T1, T2, etc). In the second phase, these differentially weighted images are processed with a Q-MRI algorithm used for computing maps of the target parameter. The focus of this article is Q-MRI applications of proton density and the 2 primary relaxation times (T1 and T2); however, most of these principles and techniques apply to many other parameters such as diffusion, flow, magnetization transfer, and so forth. Although the principle of quantitative MRI by differential weighting applies to many tissue parameters, the pulse sequences and quantitative MRI post-processing algorithms are, in general, very different from tissue parameter to tissue parameter. Using nuclear MR (NMR) relaxometry to detect disease predates the advent of MR imaging. Damadian 1 first reported alteration of T1 relaxation times in cancerous tumors in 1971. In the early 1980s, vast amounts of experimental quantitative NMR measurements of biological tissues (animal and human, normal and diseased) were published and reviewed by Bottomley and colleagues. 2,3 Crooks and coworkers 4 also speculated on the value of relaxation times in MR imaging. Extrapolating to MR imaging this "NMR-relaxometry-disease-signature" concept was logical and intellectually appealing. Indeed, many seminal papers on Q-MRI pulse sequence design and theory were published in the early 1983 to 1988 period, only a few years after the advent of clinical MR imaging. 5-15 Whereas quantitative NMR relaxometry applies to tissues on a whole-specimen basis, quantitative MR imaging is analogous to performing many quantitative NMR measurements in parallel on the much smaller voxel size scale. Hence, if the logarithmic quantity in the left-hand side is plotted as function of time, a straight line is predicted. Furthermore, the slope of this line is equal to the inverse of T2. This is the basis of Q-MRI algorithms for estimating T2 with multi-spin-echo experiments. Again, a minimum of only 2 points (ie, 2 echo times) are required to determine the slope of this line, and hence T2, though more measured points result in a more accurate slope estimation with noisy data. When TR is very long and TE (time to echo) is very short, the MR signal is directly proportional to the unweighted number of spinning protons present in the scanned volume. Images acquired with such a technique are minimally weighted by the relaxation times and are, therefore, termed PD weighted. Thus, the PD of each voxel forms the base image matrix upon which T1 weighting (by shortening TR) and T2 weighting (by prolonging TE) add contrast information. Proton density is proportional to, and according to Equation 1 or 3, can be quantified together with T1 or T2, respectively, as the extrapolated value of the transverse magnetization in the limit of infinitely short TE (ie, the y-axis intercepts in Figure 1B and 2B at a time of 0 msec). 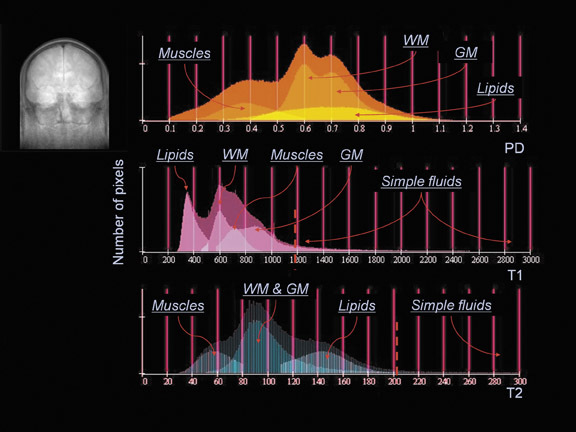 Many Q-MRI pulse sequences based on the differential weighting principle have been described in the literature. T2 differential weighting is commonly obtained via multi-echo imaging while partial saturation and inversion recovery (IR) have been used for T1 differential weighting. Some interrogate slices at many relaxation time points while some use the theoretical minimum of 2 time points. Almost all MR signal types have been used including gradient echoes, spin echoes, and hybrid readout methods (fast or turbo spin echo and echoplanar imaging). 16 Many of these Q-MRI pulse sequences target a single relaxation parameter, but a few are capable of targeting multiple parameters (T1, T2, and PD) in a single scan. Some described Q-MRI pulse sequences interrogate 1 slice per scan and others provide volume coverage. As with MRI in general, increasing the scanning speed of Q-MRI is of paramount importance for clinical acceptance. The main roadblock to faster Q-MRI has been the loss of quantitative accuracy possibly associated with increasing imaging speed. Possible sources of error include imperfection of RF pulses in multislice imaging, interslice crosstalk, magnetization transfer effects, and computational inaccuracies from using a reduced number of time points with real data that, in general, contains varying levels of noise. The theoretical "gold standard" Q-MRI pulse sequences are fully relaxed (ie, infinite TR), are single-slice, and interrogate tissues at an infinite number of relaxation time points. To illustrate the slowness of such an approach, to generate one 256 Z 256 T2 map with a multi-spin-echo sequence operating at 8-second TR, a scan time >34 minutes results. 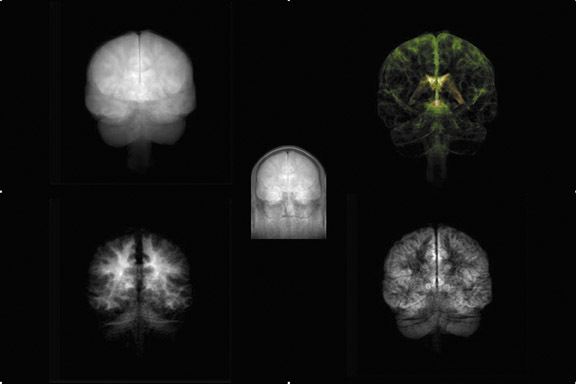 Quantitative maps of T1, T2, and PD are not the only end products of Q-MRI. These data-rich maps may be further processed using a wide variety of approaches to yield information that may be more clinically useful. Computer postprocessing of Q-MRI data is a natural next step in data interpretation and may involve techniques such as segmentation, volumetry, structural analysis, and the generation of MR images with computer-synthe-sized T1 and T2 contrast weightings (Figures 6 and 7). Q-MRI maps may be used as source data for semiautomated or automated segmentation into organs or tissue types based on MR biophysical properties. 17-24 Particular voxel subsets may be chosen from a multiaxis plot of values such as T1, T2, and PD (Figure 3). Voxel spatial relationships may also be combined with Q-MRI relationships to aid in anatomic segmentation (Figure 4). Segmentation serves as an intermediate step in quantification of organ volumes as well as in generation of frequency histograms. Frequency histograms may also be generated from the entire scan data set or segmented subsets of organs or tissue types (Figure 5). 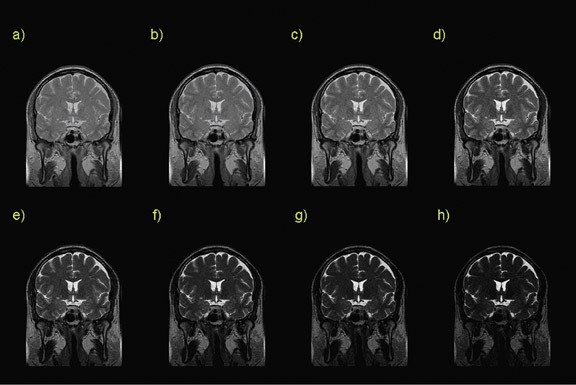 Weighted combinations of co-registered Q-MRI maps may be used to create synthetic MR images that mimic directly acquired images (Figures 6 and 7). 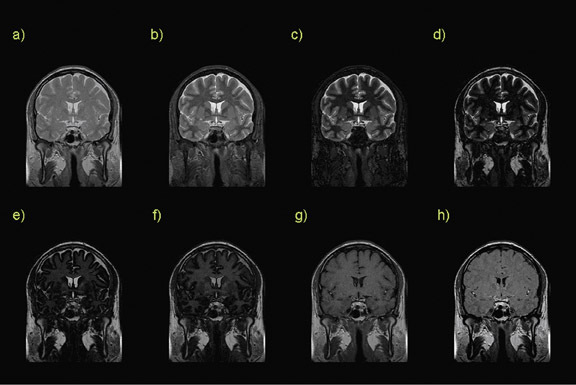 7,8,25 Though these image sets may resemble their traditional MRI counterparts, they differ significantly in that the radiologist may vary the degree of T1, T2, PD, and IR weighting at the time of reading. The most tangible benefit to this type of imaging would be the enormous potential time savings possible in replacing multiple pulse sequences in a conventional MR examination with a single Q-MRI pulse sequence. Relative weighting may be varied analogous to windowing and leveling in a CT study. Q-MRI techniques that are becoming mainstream in current clinical practice include diffusion and perfusion in the setting of cerebral ischemia and infarction. Although these techniques are quantitative, in current clinical practice, the information is usually interpreted in a subjective manner using visual inspection of the maps to detect relative differences in pixel brightness (eg, apparent diffusion coefficient [ADC] and perfusion maps) in much the same way directly acquired images are interpreted. Though applications of Q-MRI specific to quantification of T1, T2, and PD have been discussed in the scientific literature, they have not yet found routine use in clinical practice. 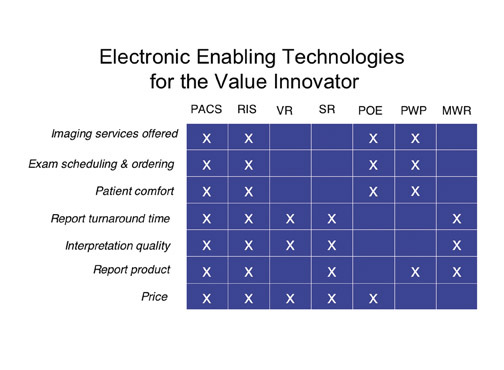 A review of promising clinical applications follows. As with many early MRI techniques, one of Q-MRI's first demonstrations in humans was in the brain. As an examination that is less prone to motion artifact than imaging of other body parts, quantification of relaxation times in gray and white matter as well as cerebrospinal fluid was an attractive initial application for the Q-MRI technique. Almost all Q-MRI pulse sequences have been tested in the brain showing the normal QMRI brain architecture. 26-37 A complete review is outside the scope of this paper and can be found in the book edited by Tofts. 38 Pathological deviations studied with Q-MRI include the effects of iron deposition in patients with Parkinson's disease, 34,39 abnormal Q-MRI measures in multiple sclerosis plaques, 17,40-42 as well as cerebral edema related to stroke. 43,44 Q-MRI relaxometric studies of patients with schizophrenia 45 and with human immunodeficiency virus infection 46 have also been published. Another application in clinical practice includes the characterization of liver lesions. T1 and T2 relaxation times measured by echoplanar methods have been shown to be helpful in the evaluation of focal lesions. 50 Dual-echo T2 techniques using traced regions of interest have also proved to be more accurate than conventional qualitative visual methods in differentiating benign from malignant foci. 51,52 These techniques have not found widespread use, however, perhaps due to the perceived complexity of relaxation time calculation. The amount of hepatic iron deposition in diseases such as primary and secondary hemochromatosis has been repeatedly shown to correlate closely with T2 and T2* relaxivity. 53-55 Q-MRI may be used not only to determine the severity of iron deposition, but also to monitor response to medical therapy. 56 Other diffuse liver diseases that may benefit from Q-MRI analysis include steatosis, hepatitis, and cirrhosis; however, further work is needed to determine Q-MRI efficacy in these disease processes. Both T1 and T2 measurements have been made in vivo in the preterm human placenta showing significant decrease in T1 relaxation times in placentas of compromised pregnancies (pre-eclampsia and intrauterine growth restriction) compared with times in those of controls. This has been postulated to be due to placental infarction and fibrosis. 71 A similar in vivo assay has been applied to measurements of fetal lung maturity, showing a relationship of both T1 and T2 to gestational age and lung volume. 72 The implications for these studies include potential noninvasive quantitative approaches to measuring fetal health. Applications in cartilage have included spin-echo measures of T2 in human cartilage. 78 T2 times increase with early osteoarthritis and then decrease with more severe osteoarthritis. T2 maps have also shown significant intercompartment and intracompartment variability, reflecting focal cartilage defects seen in early osteoarthritis. While the concept of using magnetic resonance as a quantitative tool predates the development of MR imaging, the clinical practice of MR imaging has been predominantly qualitative for much of its history. With the ongoing development of more powerful and precise scanner and computer hardware, as well as innovations in fast pulse sequence design, Q-MRI is rapidly becoming clinically feasible. T1 and T2 relaxation times and PD may be measured and mapped with a variety of pulse sequences, including ones that measure all 3 properties simultaneously. Use of coregistered maps of T1, T2, and PD may be further postprocessed for segmentation and volumetry, generation of distribution histograms, as well as derivation of synthetic MR images. An exciting potential future application utilizing Q-MRI postprocessing may even include design of computer-aided detec-tion/diagnosis tools. Q-MRI techniques have already been shown in many organ systems throughout the human body in an effort to improve diagnostic sensitivity as well as monitor therapy. As these methods employ conventional MR scanning equipment, Q-MRI shows the potential for widespread adoption in clinical practice as well as the promise of more automated and efficient MR image processing. Applications of quantitative T1, T2, and proton density to diagnosis. Appl Radiol.